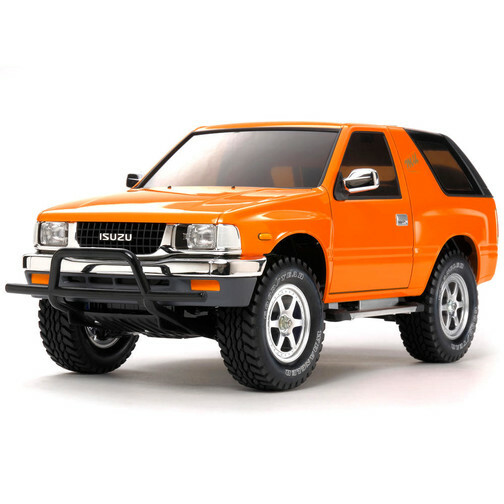 The Isuzu mu Type X, which originally appeared back in November 1995 is once again available as a Limited-Edition R/C assembly kit. With a 2m33cm wheelbase, the 2-seater mu was based around a tough off-road chassis that employed a ladder frame and rigid rear suspension. The actual car was also rebadged and sold in other countries with names such as the Frontera Sport, Amigo and Rodeo Sport. Tamiya?s R/C kit employs a highly realistic injection molded body and it is mounted on the reliable and easy to maintain CC-01 chassis, making it a joy to drive both on and off-road! The All-Terrain CC-01 Chassis The CC-01's highly reliable and efficient full-time 4WD system features a longitudinally-positioned motor, which transmits power to the front wheels via the gearbox and to the rear wheels via propeller shaft. Front and rear differentials enable smooth cornering, and for even greater off-road performance on rough terrain, the rear differential may be locked during assembly. The chassis suspension employs double-wishbone front upper single links and lower H-shaped arms plus rear rigid suspension. With 4 CVA oil dampers in total fitted to the front and rear, there's enough cushion to take on even the roughest surfaces. TBLE-02S Speed Controller is included.